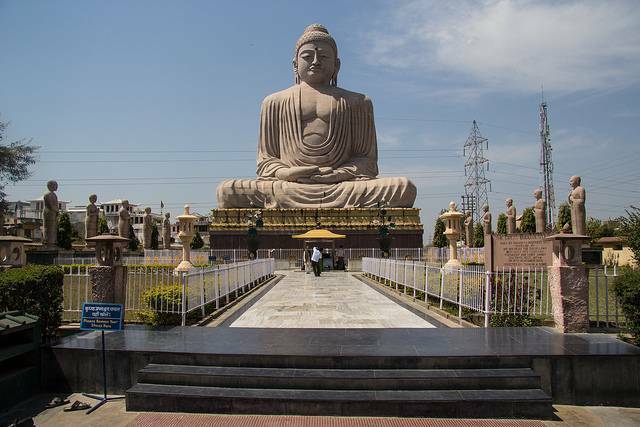 A sacred pilgrim site for Buddhists Bodhgaya, formerly known as Uruwela is where Prince Siddartha gave up the aesthetic and luxurious living. It is in Gaya, where under a Banyan Tree known as the Bodhi Tree he achieved the Enlightenment and the religion of Buddhism was born. The Temple of Mahabodhi, to the east of the Bodhi Tree, is a 170 feet tall visual treat for the soul. This beauty was declared as UNESCO’s World Heritage Site 15 years ago. Its brilliant architectural intricacies, especially the roof of the shrine which soars like a pyramid is absolutely marvelous. It is believed that the foundation of the shrine was laid by King Ashoka and then the major construction was done during the reign of Gupta Empire. As Buddhism insidiously faded from India, the temple was eventually deserted. It was finally revived by archeologist Sir Alexander Cunningham 1883 with various tough excavation efforts. The statue of Lord Buddha painted with gold and was carved by the Pala Kings of Bengal from a black stone, where he is seen in an Earth Touching seating position. Travelers can witness a serene atmosphere, filled with monks reflecting over the scripts of Dharma and meditating all over the Temple Complex.